Have a batch of leftover cooked ham from Christmas or Easter dinner? Or maybe a little pulled pork begging to be used? 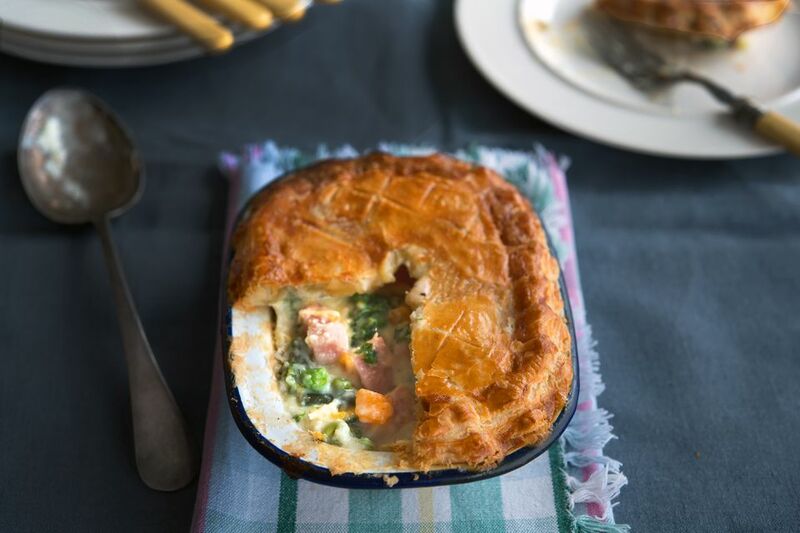 Look or further than this easy ham pot pie. Using ready-made frozen pastry—and even frozen vegetables if you're short of time—you can have a crowd-pleasing family dinner on the table in an hour. Note: while there are multiple steps to this recipe, this ham pot pie is broken down into workable categories to help you better plan for preparation and cooking. Gather the ingredients. Using a little of the butter, grease either two 8 x 5 x 2- inche deep, individual pie tins or an 8 x 2-inch deep pie plate. Set aside. Bring a cup of water to the boil in a small saucepan, add the diced carrots and cook for 3 minutes to soften them. Strain and keep to one side. In a large saucepan, melt the butter and add the chopped onions and celery. Gently fry over medium heat and gently for 5 minutes to soften. Add the flour to the pan and stir well, cooking for 2 minutes, then slowly adding the milk a splash at a time. Stir well between each addition. Add the pinch of mace if using, and the salt and pepper. Stir until the sauce has thickened to the thickness of heavy cream. Add half of the beaten egg and stir well. Add the carrots and mixed vegetables to the sauce and stir, cooking for another 5 minutes. Remove from the heat and leave too cool. The sauce does not need to be cold, so 10 minutes should be long enough. Once cooled, add the parsley and the ham pieces. Lay the pastry on a lightly-floured work surface and cut two pieces to line the tins and two for the lids, or two circles to fit the pie plate. Line the base of your chosen serving dish with one piece of pastry and fill with the ham and vegetable sauce. Brush the edges of your dish with the beaten egg and lay the lid over. Press lightly, then crimp the edges with your fingers or the edge of a fork to seal the pie. Cut a small hole the size of a pencil into the center of each pie and then brush the surface all over with the remaining beaten egg. Bake in the center of the heated oven for 25 to 30 minutes until the pastry is golden and risen, and the sauce is bubbling. It may bubble through the hole, but don’t worry, it adds to the character of the pie. Serve immediately with fresh, seasonal vegetables of your choice. If you're in a hurry and using frozen, diced mixed vegetables in the sauce, there's no need to defrost—just stir through the hot sauce as directed above. You can replace the leftover ham with pulled pork for a delicious variation of the pie. Add 2 tablespoons grated cheddar or similar cheese for an extra tasty topper. Vegetarian guest coming for dinner? Make the recipe as above, but leave out the ham and add 4 tablespoons of strong cheddar or similar cheese into the hot sauce before cooling in step three.